GOLF: He is touted as one of the best amateur golfers in the world. A Gympie junior star, Charlie Dann is tipped to turn pro at the end of the year and if the experts are right, the long-hitting talent could be the next Jason Day. He recently signed a lucrative deal with equipment giant Titleist, and is currently ranked number two in Australia. 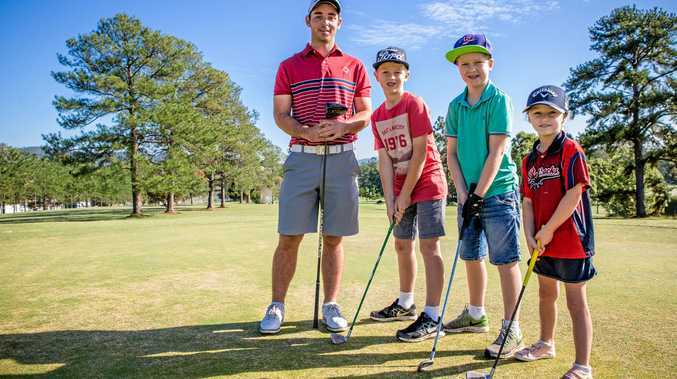 The former James Nash student was on hand at Gympie Golf Club on Sunday, conducting a junior clinic for some of Gympie's youngest up-and-coming golf stars. The clinic doubled as a fundraiser for Dann, who will head to Europe and America in the coming weeks to take on the some of the best players in the world at iconic courses like St Andrew's. His overseas sojourn is on the back of a stellar 18 months which had the Pelican Waters member sneak inside the world's top 50 ranking. His sights are now firmly set on the US amateur in Los Angeles at the end of August. In the mean time, he is giving back to the club that launched his success. "It's great, I don't get back here (Gympie) as much as I would like," Dann said. "Giving back is the biggest thing for the juniors. "I really want to become a role model for kids in Gympie." Dann's first coach and Gympie golf pro Patrick Jones said the star's dedication to the game over his career is something to be applauded. He is hoping Dann's presence back in his home town will encourage the next crop of youngsters to stick with the game. "Charlie is fairly unique. You don't come across many sports people like him," Jones said of his former student. has a good support network and has natural ability. "His attitude is better than a lot of others out there."